And the award goes to…Caramel Bacon Popcorn! Netflix quite specifically believes I enjoy these genres of movies. Netflix is often wrong, and while I appreciate the effort, Netflix does not realize that often movies are just a vehicle for popcorn consumption. Popcorn is perhaps the best snack ever. I don’t have a microwave (gasp!) or an air popper (sigh!) so I pop it the old fashioned way, in a pot on the stove. This method only takes 5 minutes and saves me from the dreaded ‘popcorn lung’. In my work, I inhale enough flour to contract the fictitious ‘pasta lung’ – one less ‘lung’ to catch the better. The buttery flavour in microwave popcorn – that’s the culprit – a chemical diacetyl was used as a flavour enhancer. Luckily, after many lawsuits almost all major brands of microwave popcorn do not contain diacetyl anymore, so we can all breathe a little easier. In spite of this, I’ll stick to making my own popcorn and knowing all the ingredients, thank-you-very-much. And popcorn I make – truffle salt popcorn, caramel corn with nuts, olive oil and pepper popcorn and the Pièce de résistance – caramel bacon popcorn. Salty, sweet, gooey and crunchy, delicious. 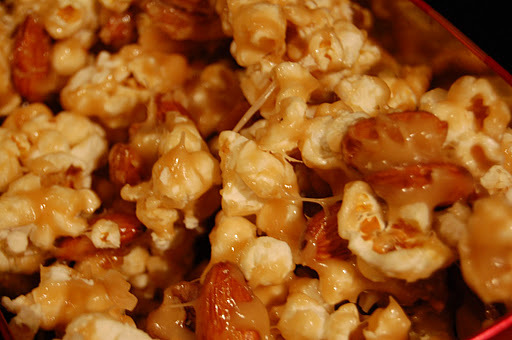 Caramel Coated Popcorn with Pecans, Almonds and Bacon! 1) Butter 2 large baking sheets. 2) Combine popcorn, bacon and nuts in a large bowl. occasionally for 10-15 minutes until dark golden. 4) Add vanilla carefully, it will sputter. quickly. Allow cool and break into pieces. 7) Store in sealed container for up to 2 weeks – but it won’t last that long, I promise! ****feel free to leave out the bacon – keep the recipe the same or add 3/4 cup of something else, toasted coconut, dried cranberries – go wild! This makes me want popcorn. Gotta to disagree with the last point, that you could leave out the bacon. The bacon is the best part, and should only be increased! I have to try this, my mouth is squirting saliva and my tummy is grumbling just thinking about it!!!! YUM! 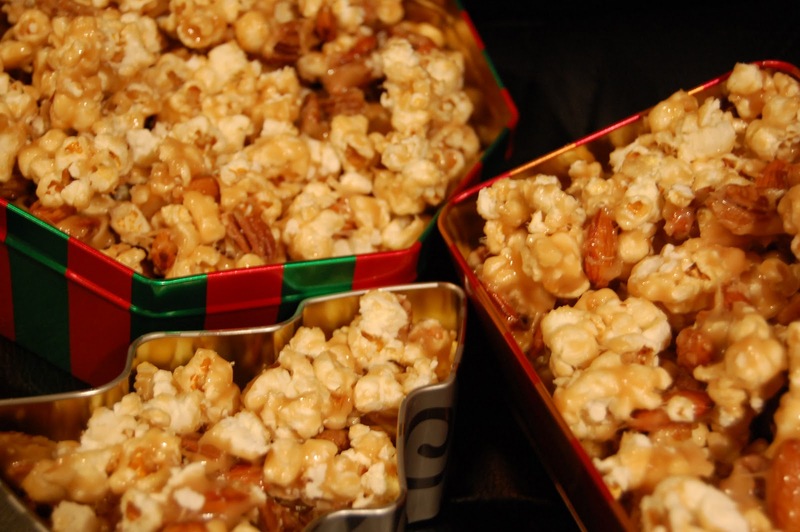 I’ve been on a caramel corn kick lately, and I must make this! Thanks for posting the recipe. I tried one from Martha Stewart, but it didn’t not impress.